Spending her career researching the brain in general, and emotions in particular, Barrett is able to illustrate how the classical framework of emotion is different from how things actually work. For example, in classical theory, the brain produces a universal emotion in response to a particular input. Barrett's research shows quite a different story: different brains react differently to the same input, indicating that different people have different experiences even though we use the word to describe the emotion. Barrett reminds readers that the brain itself never experiences reality. Instead, it experiences life through a variety of sensory input (nerves that feel, eyes that see, ears that hear) and spends its existence bringing meaning to the signals it receives. All the world we know is a simulation based on sensory inputs and our predictions about what will happen next. For any given set of inputs, we run a number of simulations, discarding the ones that seem less likely. To efficiently handle these constant simulations the brain develops guides, Barrett calls "concepts". Concepts allow the brain to quickly match a set of input patterns to responses. This allows the body to prepare, in advance of recognition, for the needed action. We start developing these concepts from infancy and continue to develop them as we age. Concepts are strongly influenced by our environment and how we see other people responding their simulations. This is in part what emotional outputs have so many different forms. Some people clench their fists in anger while others blush and turn silent. Some people cry with joy others only cry in pain. Concepts also inform our ability to identify and distinguish between different emotional states. Much like colors, people who were raised with a little emotional vocabulary tend to express themselves in few emotional states. People raised with a larger emotional vocabulary tend to express themselves with a larger range of emotions. I recently learned Schadenfreude ("...the experience of pleasure, joy, or self-satisfaction that comes from learning of or witnessing the troubles, failures, or humiliation of another." Wikipedia). After having a word for the emotion, I find that I am more aware of the emotion than I was before. Barrett suggests this is not because I am actually experiencing the emotion more, rather that I recognize it when I do because I now have a word for it. In her research, Barrett found this was not representative what actually happens in the brain. 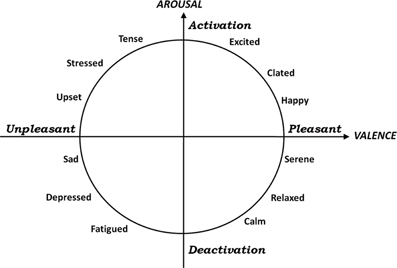 Instead, people feel emotions in two emotional spectrums: arousal and valence (or pleasantness). An emotion like "anger" is unpleasant and may be arousing, if you are driven to action, or not arousing if you retreat within yourself.